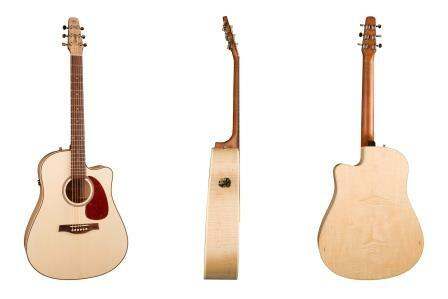 This is going to be a brief overview of the Seagull Performer series of acoustic guitars. The Performer Series are designed, as their name suggests for gigging guitarists and naturally all come with in-built electronics as standard. The Performer series is a small series and features the following 4 guitars. Some of the longer names in acoustic-guitardom, for sure! All guitars in the series feature a Solid Spruce top and Laminate Flame Maple back and sides. They also all have in built electronics and tuner and all have cutaways. Their names pretty much give away their differences, with all that detail – but let’s take a look at each guitar in more detail individually. All prices are roughly converted into US Dollars from Canadian Dollar MSRP. 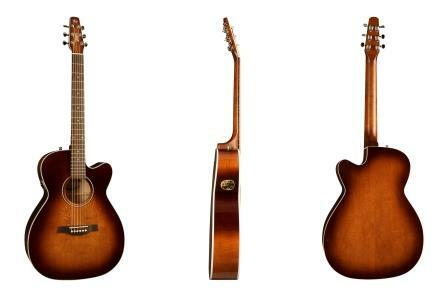 The first in the Performer series is the Dreadnought model. Each model is in a different shape/size. Like all Seagull guitars the Performer series guitars also feature their unique tapered headstock. Also, as is common on Seagull guitars (though certainly not on all), is the wider nut width. The 1.8” (45.7mm) nut width is wider than standard and helps for playing fingerstyle, particularly. And some people just prefer a wider neck. This is largely the same as the previous model, but with one major difference. It’s in Seagull’s Mini-Jumbo shape. This shape is slightly smaller overall than the Dreadnought and features a narrower waist and a larger lower bout. It has a shallower depth than the dreadnought. All of this will produce a tone that is stronger in the mid-range than the Dreadnought version and a less “boomy” sound overall. A more balanced tone across the spectrum. You can see the dimensions for all of Seagull’s different guitar shapes in the table below. The Concert Hall Performer model is similar in that it shares a lot of the same characteristics as the other two in the series – i.e. the same tonewoods, electronics, scale length, nut width etc. with the most notable difference being the shape again. The Concert Hall model, features a much smaller shape than the other two – the lower bout, upper bout, waist, body length and body depth are all smaller. This will produce a sound that is more responsive to a softer touch – but will have a lower volume ceiling – in other words – you’ll get more out of it with a softer touch but if you drive it too hard, the sound will start to distort more easily. This model is great for anyone who plays a lot of finger-style. There are also a couple of other small differences with this model – the most obvious one being the finish. It is in Seagull’s “Burnt Umber” finish. The other difference is that this model doesn’t have a pick guard. But neither of these things affect the sound. Finally, we have the Folk model. Again, most things are the same as with the other models, apart from that one major difference, being the shape/size of it. But there is also another difference here. The Folk model features a shorter scale length – 24.84” (631mm) giving this version a more slinky playability – and a bit easier on the fingers and easier to produce bends/virbrato. 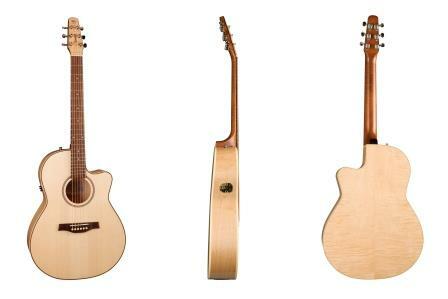 Due it also being a smaller size, the Folk model will have a lot of the characteristics of the Concert Hall – but still subtly different – but it’s another good option for fingerstyle players – especially those looking for a shorter scale length. It has a narrower upper and lower bout width than the Concert Hall – but it has a wider waist – and also a slightly longer body length and a deeper body depth. That was just a brief overview of Seagull’s Performer series guitars, but I hope it’s given you a perspective on these guitars and whether one of these models might be suitable for you.